A wonderful addition to any celebration! Combine caramelized shallot, garlic, egg, bread crumbs or crackers, rosemary, pepper flakes, thyme, salt and pepper in a large bowl. Mix in the turkey. Shape the turkey mixture into 1 ¼ inch-diameter meatballs. Push havarti pieces into middle of meatballs. Heat the oil in a heavy large frying pan over medium-high heat. Add the meatballs and sauté until browned on all sides, about 5 minutes. Turn off heat. 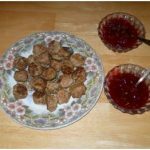 Transfer the meatballs to a baking pan, bake at 350°F, for approximately 10 minutes or until done. Season with salt and pepper. Serve with hot pepper jelly or cranberry sauce with orange zest.